The bathing season starts 15 May and ends 30 September. During that time the Environment Agency (EA) monitors bathing water quality all along our coast on a weekly basis; the Partnership has an interest, of course, in the quality of the bathing water at Bournemouth Pier, as well as in the stream itself as EA results will indicate whether our projects are having an effect at the coast. 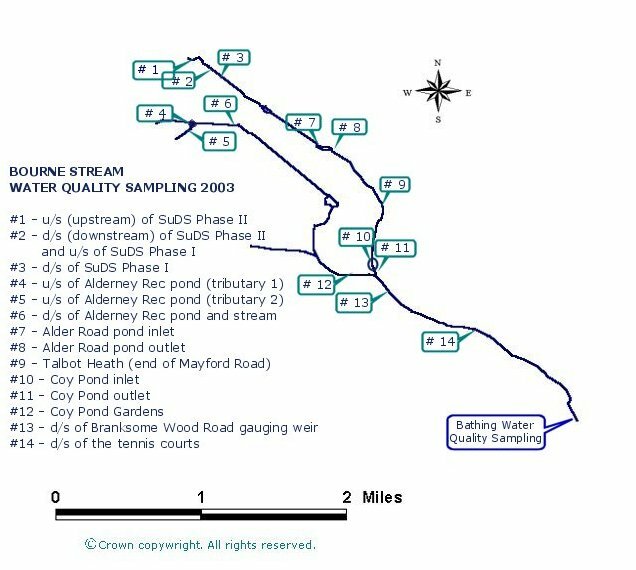 During 2003 stream water quality was also tested weekly, at 14 different points, with the EA and BSP Project Officer working together on sampling, and partner Sembcorp Bournemouth Water (then known as Bournemouth and West Hampshire Water) undertaking analysis. Comparisons can be drawn with future years' results to demonstrate the success (or not) of the various SUDS created, and other source control measures undertaken this year and in the future. The summer of 2003 was exceptionally dry and hot, with an average monthly rainfall (May-September) of just 34.6mm, compared with 70.3mm in 2002 and 40mm in 2001. Subsequently, the downpour on 28th August (12.5mm of rain) brought large quantities of road run-off - a major source of diffuse pollution - to the stream via surface water drains and overland. We have data to demonstrate the performance of the SUDS at Alderney on that day, and other graphs that compare the quality with the week before the rain - you can find them here. The EA have developed a General Quality Assessment (GQA) scheme for rivers and for the classification of estuaries (below). On the basis of the standards set for chemical quality, allowing that the overall grade will be the lowest of the three measurements, the Bourne Stream in 2003 can be judged as Grade D 'fair'. For level of nutrients (nitrate) the stream is classified Grade 3 'moderately low'. The table above is an informal grading by the Partnership from mean data analysis of water samples collected between May and September 2003, and based on the EA's GQA standards (see below). The Bourne Stream is not defined as a bathing water, but because of the number of children that like to play in it in Bournemouth's Lower Gardens, and elsewhere, during summer, the Partnership bear these standards in mind when considering water quality issues and targets.